Radishes are farmed throughout Cyrodiil. They are identified by a clump of leaves growing out of the ground. An extremely tall red and green plant found in the Mania portion of the Shivering Isles. 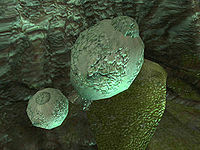 It has several small yellow gas bladders which can be harvested for alchemical purposes. 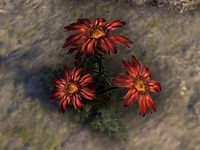 Red lichen is a rare plant, found growing on rocks in the Ashlands of Vvardenfell. This plant grows in the shade beneath cliffs and near rocks. It was used by an alchemist during the Interregnum to create a potion that would counteract the effects of fumes that had suddenly filled the Deepcrag Den kwama mine. 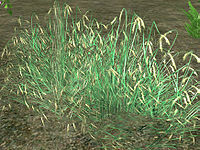 Rice can be found in food larders throughout Cyrodiil, but it does not grow there. Rice plants are sometimes cultivated in alchemy gardens. Roland's Tear is a rare variant of Gold Kanet once found exclusively in small amounts in the Ascadian Isles, near the ruins of Ald Sotha. It was sacred to the Tribunal, and was sacrificially burned at shrines. 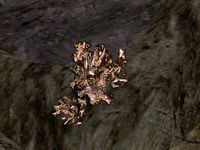 It was also prized by alchemists for its wondrous powers when used in potion making. A single red-petalled specimen was held by the Aldmeri Dominion in a secure vault in Marbruk circa 2E 582. The flower likely went extinct during the Red Year, when Baar Dau's impact destroyed the surrounding area and created Scathing Bay. 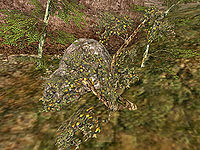 Roobrush is a common shrub found throughout the West Gash region. 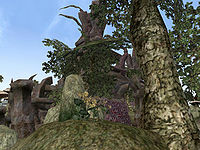 The Root (or Root System) is a theoretical living organism that connects all plant life in the Shivering Isles. Roses-of-Archon, found in Archon's Grove. 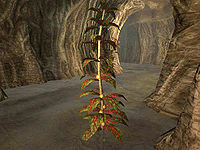 Rot Scale is a white scaly plant found primarily in caves in the Dementia region of the Shivering Isles. ^ dialogue from Justiciar Tanorian and the Archon's Grove loading screen text. This page was last modified on 17 March 2019, at 11:42.